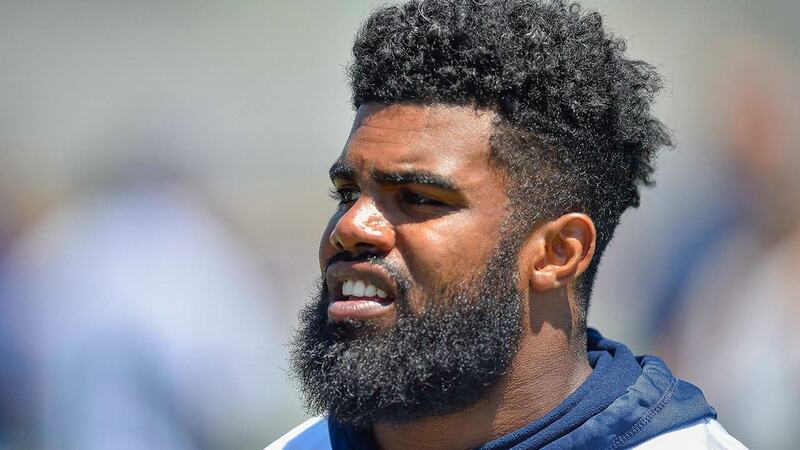 SHERMAN, Texas -- An arbitrator denied Dallas running back Ezekiel Elliott's appeal of a six-game suspension in a domestic violence case Tuesday, but the 2016 NFL rushing champion will play in the opener because of the timing of the decision. Elliott attorney Jeffrey Kessler told the judge near the end of a nearly 2 1/2-hour hearing in federal court that Elliott's suspension was sustained by arbitrator Harold Henderson. At the start of the hearing, NFL attorney Daniel Nash told the judge it was "his understanding" that Elliott could play Sunday night against the New York Giants because the league didn't want to rush the judge. U.S. District Judge Amos Mazzant said he would rule on Elliott's request for a temporary restraining order by Friday. If the request is denied and no further legal action taken, Elliott's suspension would start in Week 2 at Denver. He would be eligible to return Nov. 5 against Kansas City. "We are extremely disappointed with Mr. Henderson's inability to navigate through league politics, and follow the evidence, and, most importantly, his (sic) conscience," attorneys Frank Salzano and Scott Rosenblum said in a statement released after the hearing. Elliott was suspended by Commissioner Roger Goodell after the league concluded he had several physical confrontations last summer with Tiffany Thompson, a former girlfriend. Prosecutors in Ohio didn't pursue the case, citing conflicting evidence. The 22-year-old Elliott denied the allegations in sworn testimony during an appeal hearing last week. He attended Tuesday's hearing in Sherman, about 65 miles north of Dallas, sitting quietly in a suit and tie and facing away from the audience and mostly toward the judge. The NFL Players' Association sued in federal court on behalf of Elliott last week before Henderson even ruled, saying the appeal hearing was "fundamentally unfair" because the running back was prevented from confronting his accuser in the Ohio case. Kessler reiterated most of the NFLPA's arguments before Mazzant, who pressed Nash for answers on the claim from Elliott's legal team that a co-lead investigator who questioned Thompson's credibility was left out of a key meeting with Goodell during the yearlong probe. According to the letter Elliott received informing him of the suspension last month, the NFL believed he used "physical force" three times in a span of five days in a Columbus, Ohio, apartment last July resulting in injuries to Thompson's face, neck, shoulders, arms, hands, wrists, hips and knees. Kessler again questioned why Henderson didn't allow Thompson or Goodell to testify at the appeal hearing, as did Mazzant. The judge seemed sympathetic to Kessler's claim that investigator Kia Roberts was kept out of the loop while believing that Elliott shouldn't be suspended. The NFLPA has blamed the exclusion of Roberts on NFL special counsel Lisa Friel, who was hired as a result of changes three years ago in the personal conduct policy that stiffened penalties in domestic cases. The changes came after the league was sharply criticized for its handling of the case involving former Baltimore running back Ray Rice. Nash countered that procedures with the league's investigation and the appeal were "grounded in policy" through the labor deal with the players. "You can't second-guess that," Nash told Mazzant. Last year, Elliott missed a large portion of the preseason because of a hamstring injury before rushing for 1,631 yards and helping the Cowboys to a 13-3 record. Dallas didn't use Elliott in the first three preseason games but he had eight touches in 10 plays in his only series in the finale against Oakland as the appeal case played out. Coach Jason Garrett said Elliott returned to team activities Saturday after attending the appeal hearing, which stretched over three days. Garrett said he was anticipating Elliott being at team meetings before Tuesday's hearing. Owner and general manager Jerry Jones has said the club was preparing as if Elliott would be available Week 1. NOTES: QB Kellen Moore was re-signed Tuesday after getting released on the original cut to the 53-man roster. Garrett hasn't indicated whether the sixth-year veteran or undrafted rookie Cooper Rush will be the backup. The Cowboys didn't want to expose Rush to waivers. ... LB Mark Nzeocha was signed to the practice squad, replacing WR Brian Brown.